The first battery was faulty, but so was its replacement. The Galaxy Note 7 counts as the worst smartphone launch on record. The handsets were all faulty, even the models Samsung claimed were fixed after an initial recall. In the end, not only were all Note 7 recalled, Samsung took action to disable any remaining handsets so as to avoid having any still in use exploding and causing more harm. In the background of this PR disaster, Samsung carried out an investigation into what exactly went wrong with the phone, verified the results independently with three industry groups (UL, Exponent and TUV Rheinland) and released the information publicly. Seven-hundred Samsung researchers and engineers tested 200,000 Galaxy Note 7 handsets and 30,000 batteries to discover what happened. It turns out that not one, but two battery faults caused the smartphones to set on fire. When Samsung initially released the Note 7 it shipped with Battery A. The problem with this battery is the negative electrode was deflected, meaning rather than being completely straight it could end up bent in the top right corner of the battery. This led to a short circuit within the battery and ultimately a fire. Samsung replaced Battery A with Battery B when the fault became apparent. 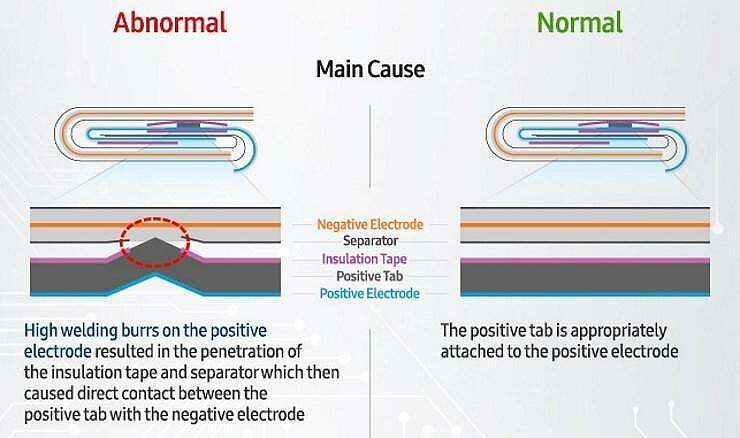 Battery B did not have the deflected negative electrode issue, but unfortunately for Samsung, there was another manufacturing issue. When metal is machined it can be left with sharp protrusions known as burrs. Battery B suffered from "high welding burrs" which penetrated the insulation tape and separator inside the battery and caused a "direct contact between the positive tab with the negative electrode." Additionally, some of these B batteries did not include the required insulation tape. The end result was the same: a catastrophic failure of the battery. So ultimately, Samsung shipped a bad battery, quickly replaced it, but did so with another bad battery. 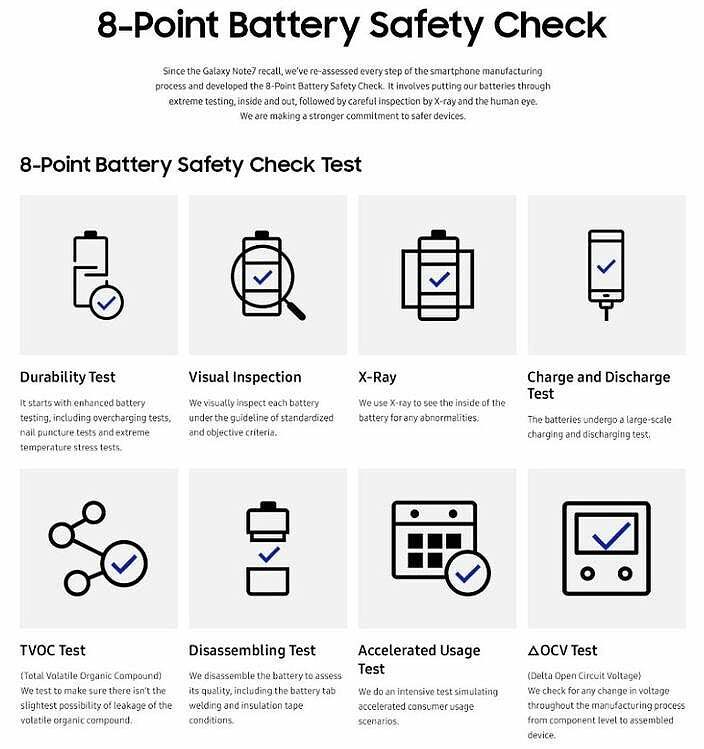 Unsurprisingly, Samsung is introducing a new eight-point battery safety check going forward. 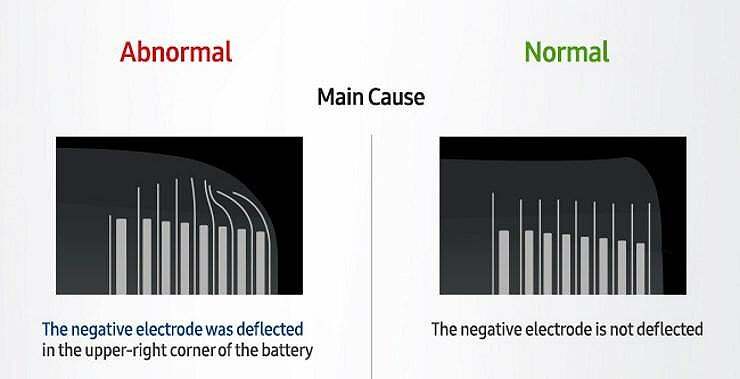 It will ensure all batteries undergo a durability test, visual inspection, X-ray, charge and discharge test, Total Volatile Organic Compound (TVOC) test, disassembling test, accelerated usage test and Delta Open Circuit Voltage test. A Battery Advisory Group has also been formed including four academic and research experts from the University of Cambridge, Berkeley, Stanford and battery consultancy company Amaz Techno-consultant. Samsung clearly isn't going to let this happen again, and I suspect all future smartphones will make a point of telling owners exactly how well tested the batteries are.